Thinking about starting a freelance communications practice? Or want to learn how to grow your independent business? In this professional development session, three seasoned, successful independents will share their experiences and tips on how to get started, how to manage hurdles along the way, and how to keep your business growing. 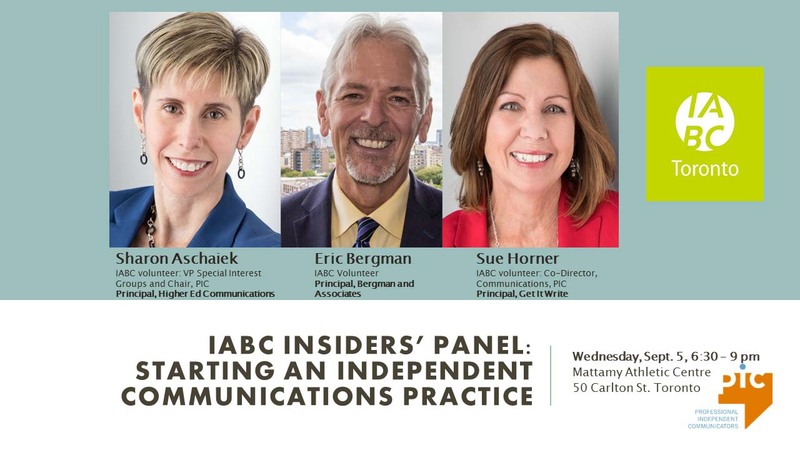 Sharon Aschaiek is Principal, Higher Ed Communications, and IABC/Toronto’s VP for Special Interest Groups and Chair of its Professional Independent Communicators (PIC). Eric Bergman, ABC, APR, MC, FCPRS is Principal of Bergman and Associates, and Sue Horner is Principal of Get It Write as well as PIC’s Co-Director, Communications. Sharon, Eric and Sue will share their tips for practitioners starting out on the independent path, and the session will close with a Q&A. CMPs and SCMPs: earn up to five professional development points toward your recertification.